Today is our last day in the Galápagos Islands. It has been such a special experience, truly once in a lifetime. Yet with the conservation efforts going on, and the incredible work they are doing to bring responsible ecotourism to this area, they will be able to afford to keep these islands protected for many years to come! Our day today started with a good hot breakfast before we all met at 8:15am to go on a hike to Tortuga Bay where we would get our kayaks for a lovely morning outing. Our hike took us through the town and to the outskirts and the edge of the national park boundary. Interestingly, there is only 3% of the land mass of the islands that are inhabited. The other 97% is devoted to the natural park, much of which is inaccessible. Only 5 Islands out of the 13-16 islands are inhabited. The four that we have visited already, and the 5th, Baltra, is where the airport is for our departure. (Baltra was annexed to the US after the Pacific invasion of WWII, where they set up an airbase…when the Americans withdrew after the war, the island was blessed with a long runway capable of commercial jets, and thus providing good access by air to Santa Cruz Island). Back to today! 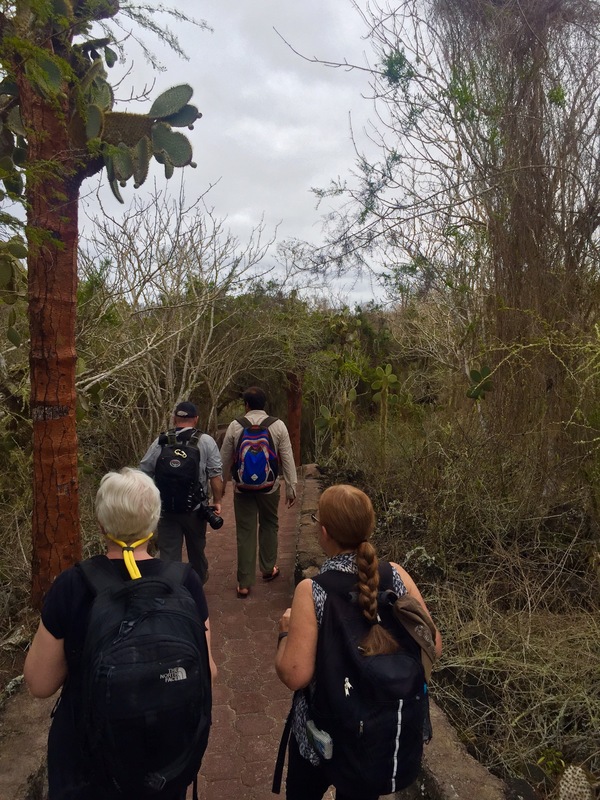 After Wilson checked us all into the park, we walked along a fabulous stone boardwalk which led us through mixed forests of cactus trees, candelabra cactuses and mixed deciduous brush. Along this short walkway we saw dozens of lava lizards gaining warmth from this rocky clearing. 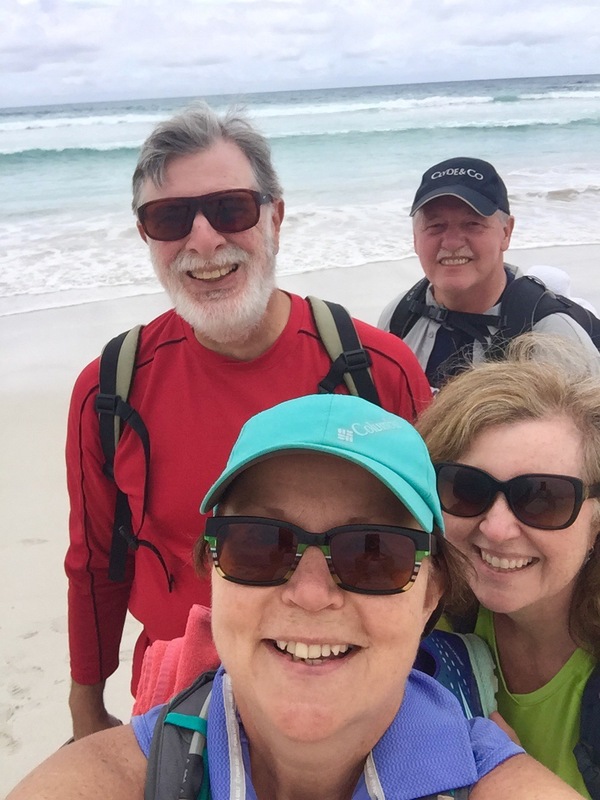 After about 20 minutes we came to Tortuga Bay…an absolutely stunning bay with the softest finest sand that I have ever walked on! (Golf courses don’t count as they sand there is not endemic!). This beach was very open to the ocean and current so swimming was prohibited here (except for some local brave souls and surfers!). We walked the length of this beach, about 1 km until we passed through a small mangrove stand and entered the beach to a very protected sandy beach and bay. It was here that we would embark on our kayaking adventure! Once we arrived, they pulled out the kayaks, and we all got our boats and paddles and listened as Wilson gave us an briefing on the sport. 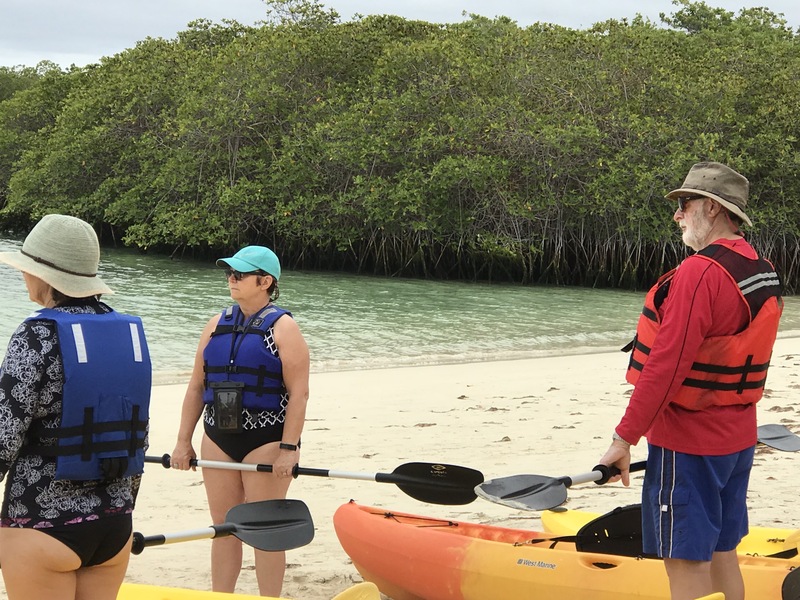 Andy, the kayak owner came out with us and took us slowly up the left side of the bay by the mangrove bushes, and stands of cactus trees. In the water there we saw a white tipped shark, a couple of eagle rays, a heron’s nest (unlike at home, these nests are only about 2 meters above the water in a mangrove tree! 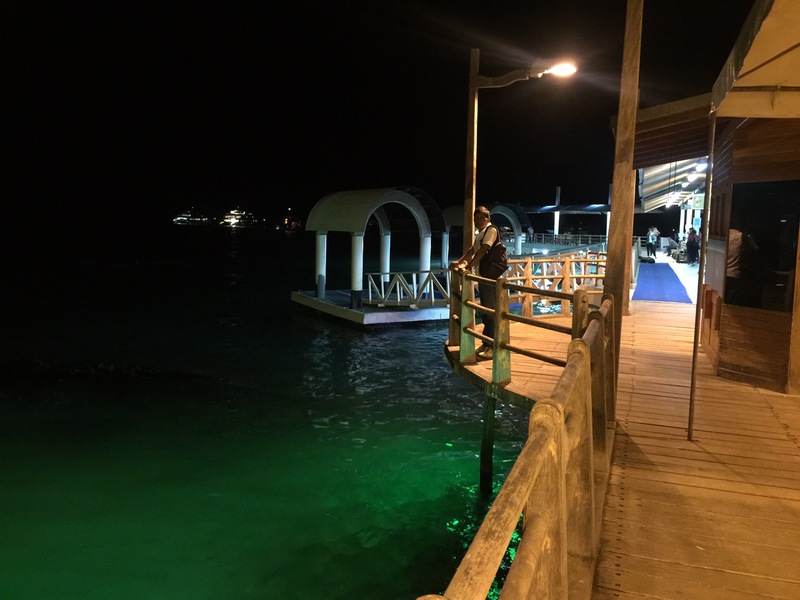 ), sea turtles and some shore crabs and marine iguana. When we got to the edge of the protected cove, we turned back and headed into the middle where some playful sea turtles decided to have some fun with us. At one point there were 3 of them playing hide and seek with us, popping their heads up and down in the water, and swimming under our kayaks. Such fun! After that, we headed towards the other shore on our journey back. 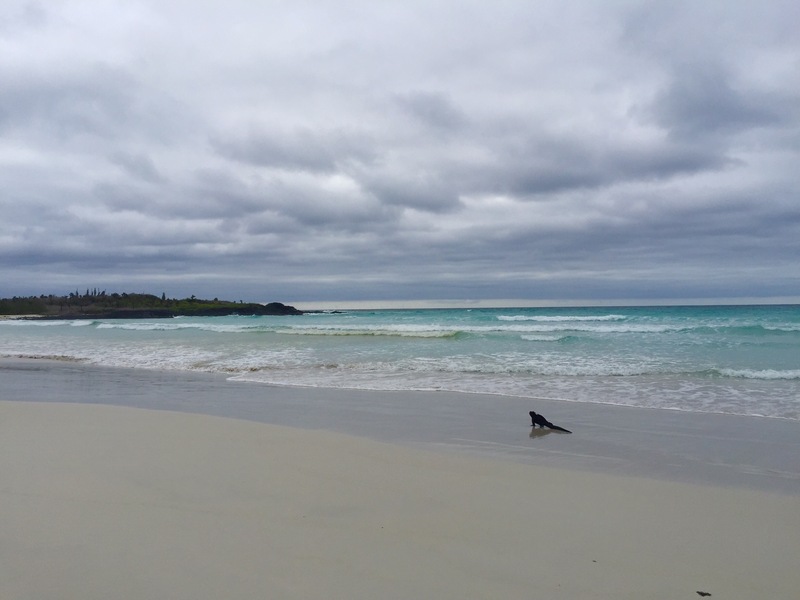 Along the shore we saw several white tipped sharks. 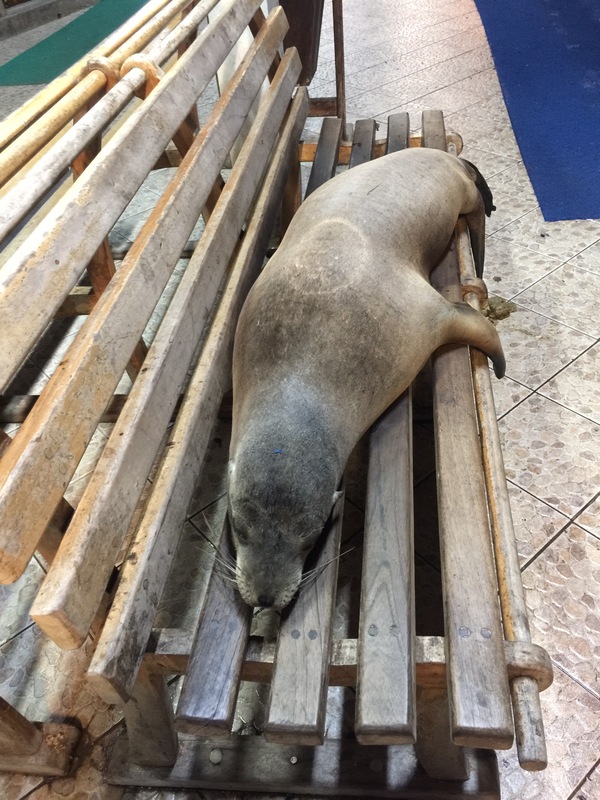 Clearly their resting spot for the daylight hours….or at least they thought it would be a good resting spot! 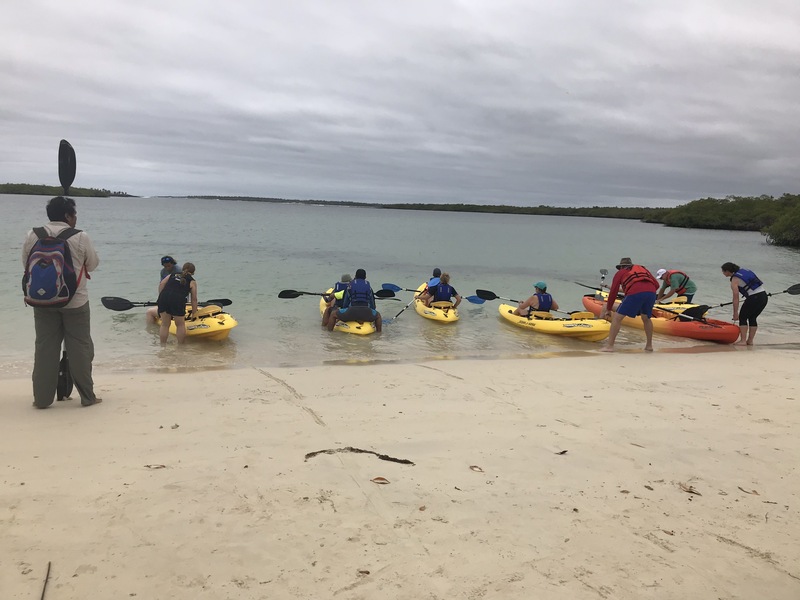 After a good look at the sharks (no worries, they do not attack humans…) we headed back to shore where we gave back the kayaks and gear. Glenn and Gwen and Dan and I waited back a bit as the others left to return to the hotel. Finally, we decided to return to town for a free afternoon….but not before we succumbed to the food street, where we stopped for lunch and the guys had Cerveza! After a lovely ( and inexpensive) lunch we headed back to the hotel to change. Gwen and I planned on doing a little shopping while the guys chose to stay back at the hotel for a rest. Gwen and I once again passed by the fish mongers and saw the predator menagerie waiting for their chance at the delightful morsel of fish! We then walk down the street and discovered that most of the shops closed down for a siesta (like most of southern Europe the shops closed at 1 to reopen around 4. What were a couple of gals to do but stop for a refreshing Helado (gelato like ice cream)! Delicious! After that, back to the hotel we went, to rest up and get ready to head out again at 4! Our excursion at 4 was more successful. We met the guys having a cerveza and soon headed back to the hotel. 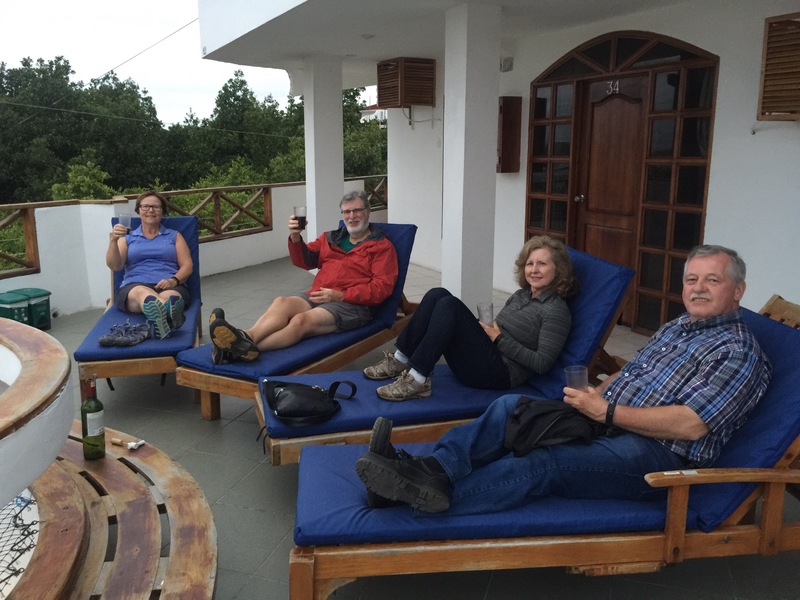 Glenn had bought a bottle of wine for our last night, and we enjoyed it on the patio adjoining our room. 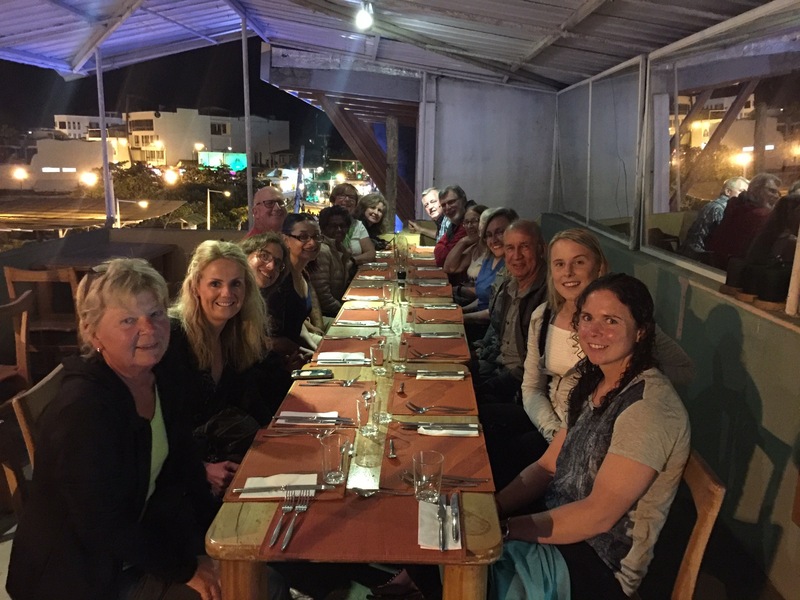 Then off to dinner with our “Family” for one last group meal together before we leave the Galapagos and our wonderful guide Wilson! A delicious dinner was had by all, and some wonderful sharing of stories and photos (airdrop is a godsend!) It was an absolutely lovely evening sitting outside on the second floor patio watching the cruise ships ready for departure. We have been so fortunate in the lovely people we have met from all over the world! Big wishes that we meet again in the future! It’s been a grand first stage of our wonderful South American adventure. We can only hope that the rest of our trip will be as full of discoveries and fabulous people! Until tomorrow –Buenos Noches! Sounds like an amazing first leg!! It exceeded our expectations! Now a long day of travel as we leave the hotel in Quito at 1:30 am! Blog might not be very coherent for the next couple of days! It’s been delightful so far! Looking firsRd to our next adventure!! This is what I think of when I think of sand. It was a shock to see the sand in Canada and other places. I love how the animals are unafraid.